Jim Doyle and Scott Graham transferred their boatbuilding business to the Shoalhaven after a combined 30 years’ experience working in some of the major boat building enterprises in the Newcastle-Sydney-Wollongong-South Coast areas. Trading as Wanderah Catamarans, they’re in the process of building their first 11.6m, 4-tonne, cruising catamaran at their Kings Point Industrial Park factory south of Ulladulla. Sail-away price for this vessel is $435,000. However, their team of seven (four of them qualified shipwrights) is also producing surfboats under contract. Their Ulladulla-built surfboats have been supplied to Burleigh Heads, Byron Bay, Bulli, Pambula as well as Canberra surf lifesaving clubs – the Canberra boat crew train on Lake Burleigh Griffin but operate in association with a South Coast surf lifesaving club. Some of their surfboats have also been supplied to New Zealand. Jim’s wife Suzie also likes to surf, having been dive master on some of the large charter boats operating on the Great Barrier Reef. Their children, aged five and three, attend day care around the corner from their home and school in Ulladulla. And Jim’s mother moved from Braidwood to be near the family at Ulladulla. Jim grew up in Gundagai. His interest in boats started through his father who ran canoe and rafting operations on the Snowy, Murrumbidgee and Nymboida Rivers. Jim helped repair his father’s flotilla. After his apprenticeship in Sydney he worked as a shipwright with Dingy Sports, building a range of sailing dinghys including 30 420-class for the World Championships; worked on myriad vessels at the Royal Sydney Yacht Squadron; did contract shipwright work in Sydney, on the NSW South Coast and in Northern Territory. He worked on surfboard shaping and glassing with Maxim Surf, TG and Munro. His first seachange lasted 12 years, took him well away from the surf and saw him mustering cattle and then engaged as a carpenter on building work in some of the most remote communities in Northern Territory. However, “once a boat builder you don’t forget your skills,” Jim explained. A NEIS small business course brought another change in career path. Moving to Ulladulla “because I wanted to surf” Jim and a Sydney partner established Wanderah Catamarans at Ingleside near Mona Vale. After a year of commuting and staying in Sydney, the absence from his young family was too hard for all concerned so an amicable agreement was reached and Jim bought him out. Then he began the search for another shipwright who would become a partner in the business. That shipwright is Scott Graham. With Jim managing director and Scott a director, Wanderah Catamarans transferred to the Shoalhaven in May 2007 to large factory premises at Kings Point, Ulladulla, where boatbuilding space is already being taxed to the limit. Scott was born in Sydney but was working at Sydney Yachts Azzura Marine when the partnership was formed. Scott started his shipwright career with Glass Yachts Australia at Taren Point, building 37-foot and 40-foot Farr design boats including a Sydney-Hobart handicap winner, the 40-foot “Indian Pacific”. At Sargent and Burton, at Mortlake, Scott worked on all four varieties of rowing shells (singles, pairs, fours, eights). A change of pace saw him with Civil and Civic as a carpenter on Tower Two at Bondi Junction, then as leading hand on the Sydney Football Stadium and foreman on Presbyterian Ladies’ College development. He was part of the research, development and building team for new Sea Wind Catamaran designs when that company was based in Haberfield, Sydney (they are now based in Wollongong). At Endeavour Yachts Warragamba, Scott worked on plug and mould-making for a new 38-foot catamaran. Then with Australian Marine Design Construction (AMDAC, at Tomago) Scott was vessel construction manager for 67-foot sports fishing boats (worth $2.5 million each). Scott was part of the pattern making and then the build team at Boatspeed for their 90-foot carbon fibre racing yacht “Boles”. At Marks Point Marina he was manager in charge of operations. 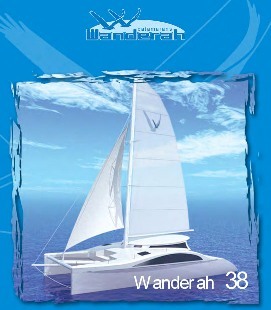 That background experience, plus the fact that for a time Scott also ran his own boat building business at Lake Macquarie, is now helping drive Wanderah Catamarans. Scott’s wife Rhonda, who was born in Penrith and has 29 years’ nursing experience in aged care, is currently a program support worker for Bay and Basin Community Resources. Their family has been actively involved in surf lifesaving, son Adam (14) attending school at Ulladulla and playing under 14 years rugby league with the Bulldogs. His team was leading their competition at the time of the interview. Their elder daughter is married and living at Warners Bay, Lake Macquarie while their 16-year-old is an apprentice hairdresser at Penrith. Scott and Jim could employ four apprentice shipwrights – if they could get them their TAFE training locally. One year of that TAFE course is taught in Wollongong but the two final years’ study would have to be at Meadowbank in Sydney – just too far for young apprentices to travel once or twice a week with no intensive, block release training for remote students available. Scott is working on the TAFE issue – at one time he taught casually at Newcastle TAFE. He wants a Shoalhaven-based shipwrights course to serve what is a very substantial local industry. However, it’s all hands on deck (when other plug and mould and maintenance and surfboat work permits) to complete their first 11.6 m Wanderah, designed by internationally renowned catamaran designer Robin Chamberlin. And they’re lobbying for more on-the-water berths for larger craft at Ulladulla – there’s just not enough currently available with a 10-year waiting list for a mooring in Ulladulla Harbour. They are keeping an eye on Shell Cove harbour and marina progress at nearby Shellharbour and see that as the potential base for a growing fleet of Wanderah Cats built in their boatshed. The Wanderah 11.6 is for serious seafarers, with the standard three-cabin layout able to accommodate six to eight persons. Headroom in the hulls is 2m, in the saloon 1.95m. It carries a 14.5m mast and a sail wardrobe with a combined 240 square metres of sail. While the sailaway price for their 11.6m Wanderah might be $435,000, Jim and Scott are also offering floataway hull and deck packages (with moulded galley and settee) at prices ranging from $155,000.